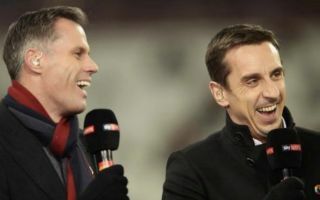 Manchester United legend Gary Neville has trolled Liverpool hero Jamie Carragher ahead of tonight’s big clash in the Premier League. Liverpool take on Leicester City this evening with the chance to go seven points clear at the top of the table after Manchester City slipped up with a surprise 2-1 defeat away to Newcastle yesterday. Neville sent a picture Carragher’s way of the Premier League’s top scorers against the Reds, adding the ex-defender’s name at the top due to his poor record with own goals. But within that cheeky message, Leicester front-man Jamie Vardy can be seen with an impressive seven to his name against the Merseyside giants in the last few years. The Foxes ace will need to be tightly marked at Anfield this evening if Jurgen Klopp’s men are to ensure they take full advantage of City’s slip-up yesterday and take a potentially big step further towards title glory. The nerves will be kicking in for LFC now as they look in with their biggest chance yet of finally ending their 29-year title drought.